Based on the highly acclaimed Oxford Dictionary of the Christian Church, this is an indispensable guide for both students and the general reader. Over 6,000 entries provide authoritative coverage of theology, patristic scholarship, churches and denominations across the world, canon law, and the church calendar, as well as entries on theologians, philosophers, artists, musicians, and mystics. The third edition has been updated to reflect recent changes in the Church. Over 100 new entries cover topics such as the Antonian Movement, dispensationalism, Heilsgeschichte, Alvin Plantinga, Garima Gospels, and Intelligent Design. It also includes a new appendix listing the Archbishops of Canterbury and a web links appendix providing online resources that are listed and regularly updated on a dedicated companion website. This handy, concise volume is essential reading for anyone with an interest in Christianity. 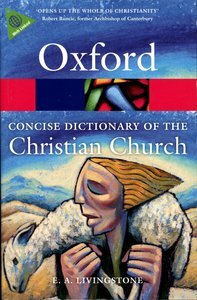 About "The Concise Oxford Dictionary of the Christian Church (3rd Edition)"